ONE: If you have some in-the-pot-swirl soap laying around, shred the bars using a cheese grater. If not, you can color some rebatch soap using either the double-boiler or plastic baggie technique. I used about 16 oz. of cold process soap. TWO: Once your cold process is grated, roll the shreds into 15 – 20 balls ranging from 1/2 inch in diameter to 1 1/2 inches. Keep CP shreds separate so colors will be more defined. This process works best with freshly grated soap. 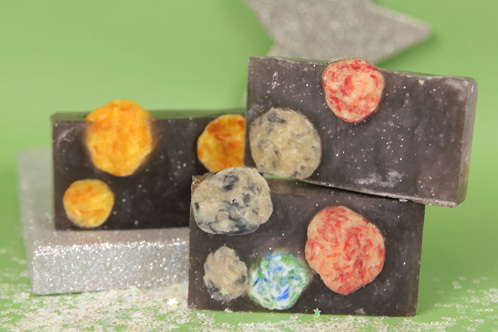 THREE: Once soap balls are rolled, it is time to make your universe. Start by melting 24 oz of clear melt & pour. Add the Luster Black mica, Black Tea Fragrance Oil and Glitter. Stir well! FOUR: Once soap has reached 130 degrees, add sodium lactate, this will thicken your soap and allow your planets to float! Spray about 10-14 of your planets with rubbing alcohol and place them into your mold. 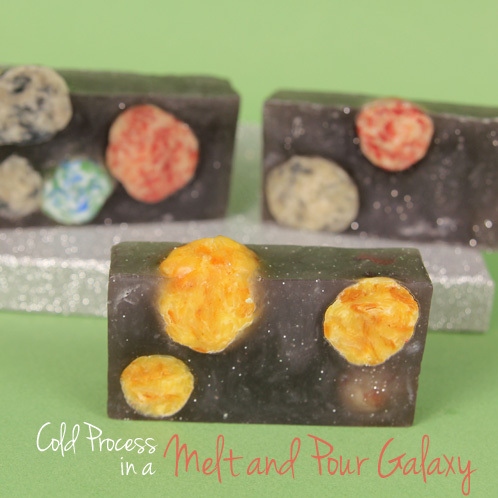 FIVE: Pour the melt & pour base over the planets and begin to add more sprayed planets. Repeat in a quick fashion until the mold is full. SIX: Spray once more with rubbing alcohol and let sit. Your soap will be ready to cut with a sharp knife in approximately 2 hours. There is no cure time needed if you used fully cured cold process soap to make your shreds with. So cool! I saw someone else said they were going to do this with just CP soap. Can you do that? I figured the CP soap would be opaque and not show up as well, but would it work? Thanks!!! While I have never tried it, I don’t see any major issues. The only thing I can see happening is that the cold process may become hot and slightly melt the melt and pour. If you give it a try, I’d love to hear how it works for you! This is awesome! I love the look of the glitter. What does glitter look like in CP soap? I’m glad you enjoyed this tutorial :). Because cold process is opaque, glitter usually works best on top of the soap 🙂 One of my favorite glittery CP recipes is the Cherry Blossom Glitter Cold Process! WHOA, impressive soap! How cool to combine CP and M&P! Would making the planets from melt and pour base would work equally well, for those M&P only soapers? I love this one! I am planning on trying it just with CP for my daughter who is having a lot of fun learning about astronomy. I can’t quite decide what my galaxy should smell like though. I might just use me lemon cake sample since my kids seem to love it and it would be for them. Whoa, so sodium lactate can be used in M&P to make a DIY suspension base? Hot dog! This is so cool! I know several kids (and adults) that would love some soap like this. I’m so glad you liked this tutorial! You’re right, it would be a great project for kids 🙂 I hope you give it a try!